This four-volume collection deals with the causes and prevention of crime as well as the treatment and punishment of its perpetrators. 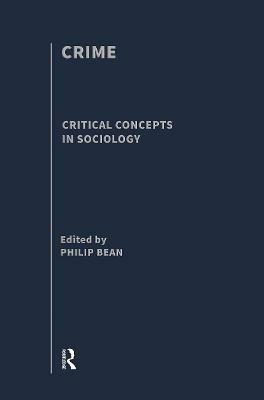 While taking a sociological approach to the subject, the articles gathered in this collection reflect the diversity of related fields and theoretical traditions which inform the study of crime - including economics, history, psychology and anthropology. The set provides an historical overview of the development of the study of crime and a picture of the field as it currently stands. With a new introduction and a thorough index, this collection is an invaluable resource for those studying this rapidly developing area. Part 1 Understanding deviance: N. Morris and N. Hawkins, the honest politician's guide to crime control, pp.2-28 (University of Chicago Press,1970); B. Krisberg and J. F. Austin, reinventing juvenile justice, pp.171-187 (Sage, 1993); W. Chambliss "state organised crime" (Criminology, vol. 27, No. 2, pp. 183-208, 1989); E. H. Sutherland "Is white collar crime crime?" (American Sociological Review, Vol.10, pp.132-139, 1945); R. Hood, capital punishment" in Tonry M. (ed) Handbook of Crime and Punishment, pp.739-776 (Oxford University Press, 1998); crime and justice vol. 4, pp.145-189 (University of Chicago Press, 1982); A. J. Reiss and J. A. Roth (eds). uderstanding and preventing violence, pp.132-145 (National Academy Press); P. T. Bean, drugs and crime, pp. 1-13 (Willan Publishing, 2001); R. Martinson, "what works" (The Public Interest Vol. 35 spring, pp.22-54, 1974. Part 2 Classical theories of deviance: C. Beccaria "Of crimes and punishments", in A. Manzoni, The Column of Infamy, translated by Foster K. and Grigson J., pp.11-20; 55-66; and 91-96, (Oxford University Press, 1964). (Part contents).